An awesome event is coming up this week from February 14th-16th here in Provo, UT! It's the annual "Life, the Universe, & Everything" science fiction & fantasy symposium! This year it will be held at the Provo Marriott Hotel & Conference Center in downtown Provo (you can register here. Students are free). This year's Guest of Honor is Newbery Honor winning author Megan Whalen Turner! (Megan will be giving the keynote address on 2/16 @ 11am). Other youth book guests include James A. Owen (last year's GoH), David Farland (aka David Wolverton), Michael O. Tunnell, Jess Smart Smiley, Kristen Landon, Melissa Lemon, Kasie West, Lehua Parker, Jeff Scott Savage, Frank L. Cole, Loralee Leavitt, Will Terry, Platte F. Clark, Kristyn Crow, Jenni James, Andrea Pearson, Tyler Whitesides, and SO many others (like, totally. So. Many. Don't miss the info. below about the mass signing)! We'll even have movie people like Jared Crossley with his documentary on fantasy author Lloyd Alexander (a showing and Q&A panel including Michael O. Tunnell, Jim S. Jacobs, & Justin Kunz on 2/15 from 10am-12pm & film reshowing @ 8pm. FYI: Michael Tunnel & Jim Jacobs, both friends of Lloyd Alexander, will be doing a separate presentation, "Lloyd Alexander: High King of Fantasy" 2/14 @ 11am) and John Lyde, director of several Hunger Games inspired short films including the Annie & Finnick webseries and the new video "The Hanging Tree", as well as several short films inspired by other YA novels such as Kat Zhang's What's Left of Me, John Green's The Fault in Our Stars, and Neal Shusterman's Unwind (John will be part of the presentation "Arrowstorm Entertainment: Dragons, Orcs, Magic & Movies" 2/14 @ noon). 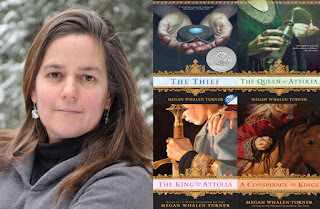 Megan Whalen Turner is the author of the young adult fantasy quartet known by fans as The Queen's Thief series beginning with the Newbery Honor book The Thief and continuing with The Queen of Attolia, The King of Attolia, and A Conspiracy of Kings. She has also written a collection of short stories titled Instead of Three Wishes, the short story "The Baby in the Night Deposit Box" published in the anthology Firebirds, and "Thief! ", a Queen's Thief short, published in the "Disney Adventures" magazine. 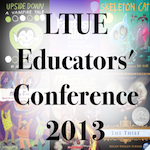 Megan will be the Guest of Honor at the three-day LTUE symposium and will be giving the keynote address on Saturday, 2/16, at 11am. There will also be a demonstration of The Candy Shop War card game sometime on Friday (I don't know the specific time--sorry!) sponsored by Shadow Mountain and demo-ed by game designer August Larson (see previous post on the Candy Shop War card game here). AND, how cool is this? 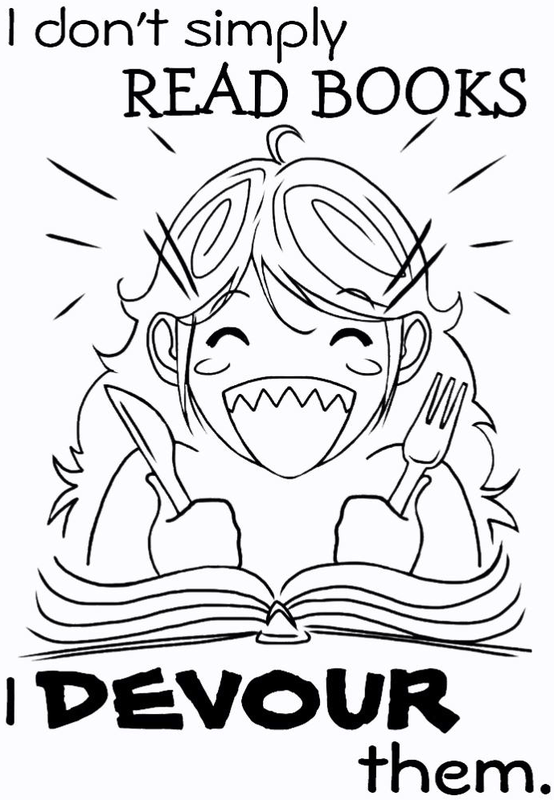 We will have a panel about the significance of food and mealtime in fiction called "A Feast of Fiction"! Christy Dorrity (author of The Book Blogger's Cookbook series), Shaunda Kennedy Wenger & Janet Kay Jensen (co-authors of The Book Lover's Cookbook), Karen Evans (who spoke last year about the history of chocolate), and Jonathan Langford (author of the essay "Sitting Down to the Sacramental Feast: Food and Cultural Diversity in The Lord of the Rings") will be on the panel and it should be a ton of fun (2/14 @ noon)! If I was brave enough, I'd be on the panel too, but for now, I'll just stick with doing posts about food in books (FYI: the panel will also discuss food in film and perhaps even video games). There will also be an Educators' Conference on Saturday, Feb. 16th from 9am-3pm (which includes the 11am keynote address by Megan Whalen Turner). We've got a fun spread of presentations geared toward k-12 teachers and school librarians including Loralee Leavitt's "Sticky, Icky, Spectacular! Making Science Fun with Candy Experiments", "Using Comics & Graphic Novels in the Classroom" (a panel with Robert St. Jacques, Jess Smart Smiley, Bill Galvan, Drew Robbins), "Successful Author & Illustrator School Visits" (a panel with Leann Moody, Will Terry, Kristyn Crow, Kristen Landon), Rachel Wadham's "Making Fantasy an Integral Part of the Common Core Classroom", and "The Best Science Fiction & Fantasy Books for Youth" with Patricia Castelli & Marilee Clark (the full schedule can be found here & click here for more info. on the presenters). And a special somethin'-somethin'--several publishers and authors have donated books for the attending teachers to take for FREE to use in their classrooms (see list of donors here). 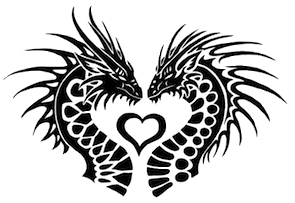 There will be a Valentine's dance on 2/14 from 8-10pm with live music by Stephen & Teresa Gashler (Stephen is the author of the YA/MG novel The Bent Sword). Costumes at the dance are optional but recommended because it's cool to dress up! (no masks, no weapons). Movies will be showing each night (Thurs. 8-10pm, Fri. 8-10pm, Sat. 7-9pm) including "Unicorn City", "Dawn of the Dragonslayer", "Lloyd Alexander", & "Flight from Shadow" (w/ behind the scenes). There will be a HUGE signing event on 2/15 from 8-10pm which is open to the public (shhh!). Barnes & noble will be on-site selling books (all three days of the symposium), some authors will have books at their signing spots as well, or bring your books from home, or bring bookplates if you don't have the books or have the money to buy them! There will be a special banquet on 2/16 @ 7pm with author Tracy Hickman as the toastmaster (I hear the Marriott's food is yummy and that Tracy is a very entertaining speaker). The banquet is open to all but the seating is limited. For the first time ever, there will be pitch sessions with editors for $20, limited availability. There will also be a dealer's room all three days of the symposium featuring authors, artists, craftspeople, publishers, SF/F organizations, etc. A few podcasters will also be at the symposium doing interviews and such. Check out all of the special events here. So if you're in the area, come and have a ton of fun! There will be panels on writing, illustrating, youth books, podcasting, movie making, zombies, Doctor Who, Superman, and so much more! See schedule here. Pre-registration prices end tonight @ $30 for 3 days and $20 for one day. After tonight the price will be $45 for 3 days and $30 for one day, still a very good deal for this type of event! Register here. And join the Facebook group here. Awesome! I'll be introducing "A Feast of Fiction" at noon. Maybe we'll see each other! And there are a bunch of fun things on Thursday, including the dance and a couple of movie showings in the evening!